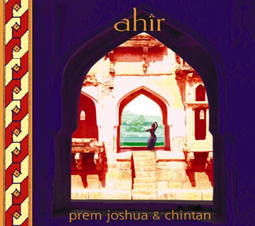 Ahir is a co-production of Prem Joshua with his longtime musical partner, loop-master, keyboardist, percussionist and composer Chintan Relenberg. With their concerts they have been touring the world together for the last 10 years and finally, ‘Ahir’ is their first album release under both their names. On this album the team collaborates with outstanding Indian master musicians, such as South Indian violinist Kumaresh from Bangalore, senior classical vocalist Mrs Sumita Guha from Delhi, and percussionist Raul Sengupta from Calcutta. Joshua and Chintan succeed in uniting the essence of Indian classical raga with infectious modern grooves in a firework of rhythms and melodies. Purists may scoff at Prem Joshua’s combination of classical Indian music and funky European electronica, but that’s why purists tend not to be much fun to hang around with. Prem Joshua, on the other hand, is probably lots of fun to hang around with, at least if his albums are any indication. Ahir finds him collaborating with keyboardist and bassist Chintan to create a complex but approachable, gentle yet robustly danceable set of East-West fusion compositions. Equally adept on sitar and bamboo flute, Prem Joshua takes the scale patterns of raga and sets them in a variety of dance-based rhythmic formats — from the thumping house setting of “Namaskar” to the strutting old-school funk sound of “Ramana” to the dubwise one-drop reggae of “Sharanay” and the downtempo simmer of “The Subject Tonight Is Love.” Best of all is “Mysore Monsoon,” a track that juxtaposes the sweet moan of the flute with the vinegary squawk of the clavinet, while a synthesizer emits a soft boing at the end of every line and melismatic vocals twine themselves around a propulsive club beat. Like all of Prem Joshua’s projects, this one offers a lovely balance between euphoria and contemplation, and puts it all to a booty-moving beat. Highly recommended.